[Debraj] wrote in about his 2-wire serial backpack he developed for a Graphic LCD screen. It’s build on a hunk of protoboard and uses a pair of 595 shift registers to translate incoming serial data to the parallel interface which is used by the LCD screen. It takes more time to push commands this way, but the interface is still quite snappy as you can see in the clip after the jump. The real trick here is how the hardware has been configured to get away without a third wire for latching the shift registers (if you need a primer on 595 chips check out this feature). The idea of using a latch is that all of the data can be shifted in over the serial pin before it appears on the output pins. Otherwise, the GLCD would see each bit as it shifts into the register, wreaking havoc on its communication protocol. [Debraj] gets around this by using a diode AND gate trick he learned from this other serial LCD project. One good thing about this method is the 595 chips have a wide range of control voltage that will allow you to drive this with 3.3V or 5V microcontrollers. But you do need to implement the communication protocol and push those commands via serial. For nearly the same cost in chips something like an ATtiny2313 could be substituted to make an even simpler addressing scheme — or even switch to 1-wire protocol. But you’d then lose the wide input voltage tolerance. 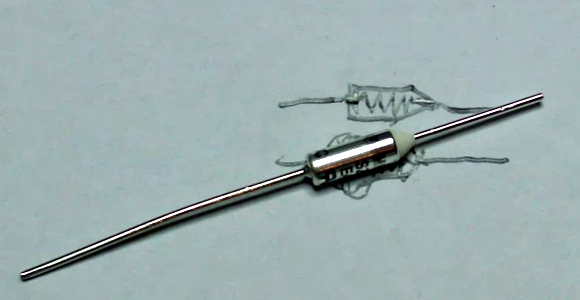 This component is a one-shot thermal fuse. When the body rises above the specified temperature the two leads stop conducting. They’re useful in applications like motors, where you want to make sure power is cut to an overheating piece of hardware before permanent damage happens. They’re pretty simple, but we still enjoyed taking a look inside thanks to [Fatkuh’s] video. The metal housing is lined with a ceramic insulator, which you can see sticking out one end in the shape of a cone. It surrounds a spring which connects to both leads and is under a bit of tension. The alloy making the connections has a low melting point — in this case it’s about 70 C — which will melt, allowing the spring to pull away and break the connection. In the clip after the break [Fatkuh] uses his soldering iron to heat the housing past the melting point, tripping the fuse. He then cracks the ceramic cone to show what’s inside. The only problem with using a fuse like this one is you’ll need to solder in a new component if it’s ever tripped. For applications where you need a fuse that protects against over current (rather than heat) a resettable polyfuse is the way to go. There’s some really cool stuff to find if you wander around a Michaels craft shop or Hobby Lobby long enough. Recently, [Ben] picked up a craft cutter – a small vinyl cutter-like device meant for scrapbooking and other crafty endevours. He’s using this machine to create solder paste stencils that are better than any laser cut stencil he’s used before. Like a build we’ve seen before, [Ben] is using a desktop-sized vinyl cutter, the Sihouette Portrait, with 4 mil Mylar. After converting the relevent layers of a Gerber file into .SVG files, [Ben] loaded up Robocut to cut very, very small holes in his solder stencil. The results are great; much better than a laser would cut Mylar, and good enough to apply paste to a few hundred boards at least. While [Ben] is using his stencils to apply solder paste, we’re wondering if a similar process could be used to apply a UV-curing solder mask to home-fabbed boards. That would allow for some very professional-looking boards to be produced with a turnaround time of just a few hours. Centuries ago, craftsmen and smiths of all sort spent hundreds of hours crafting a crossbow. From the fine craftsmanship that went into making the bow to the impeccable smithing a windlass requires, a lot of effort went into building a machine of war. Since [Chris] has a 3D printer, he figured he could do just as well as these long-dead craftsmen and fabricate a crossbow in under a day. What’s really interesting about [Chris]’ crossbow is that it is only a single piece of plastic. The bow is integrated into the stock, and the trigger works by some creative CAD design that takes advantage of the bendability of plastic. The only thing required to shoot a bolt from this crossbow is a piece of string. That, and a few chopsticks. He won’t be taking part in any sieges, but [Chris]’ weapon is more than capable of shooting a bolt across a room or launching a balsa wood airplane. You can see an example of this after the break. [Todd Harrison] wrote in not with a project but with a video tour of his local hackerspace: HeatSync Labs in Mesa, Arizona. He took a camera along with him over the weekend to record what you can expect when visiting the space. You’ll find the tour embedded after the break. It starts off with something we love to see. The space is being used for a talk and it looks to be quite well attended. The building is one unit in a string of storefronts and this provides a big open space as soon as you walk in the door. Just past this gathering area there are a few rows of electronics work benches which include hardware like bench supplies and scopes, as well as soldering and rework areas. In the back corner they’ve got a great big laser cutter and [Todd] spends some time with one of the members looking through all the fun stuff they’ve made with it. The back room keeps the messy projects like wood working, machine tools, and welding separate from the rest. The place is remarkably clean and we’ll organized. Make sure you stop by and check it out for yourself if you’re in the area. The popularization of FPGAs for the hobbyist market means a lot more than custom LED controllers and clones of classic computer systems. FPGAs are also a great tool to experiment with computer architecture, creating new, weird, CPUs that don’t abide by the conventions the industry has used for 40 years. [Victor] is designing a new CPU that challenges the conventions of how to access different memory locations, and in the process even came up with a bit of example code that runs on an ARM microcontroller. Most of the time, the machine code running on your desktop or laptop isn’t that interesting; it’s just long strings of instructions to be processed linearly. The magic of a computer comes through comparisons, an if statement or a jump in code, where the CPU can run one of two pieces of code, depending on a value in a register. There is the problem of reach, though: if a piece of code makes a direct call to another piece of code, the address of the new code must fit within an instruction. On an ARM processor, only 24 bits are available to encode the address, meaning a jump in code can only go 16 MB on either side of its call. Going any further requires more instructions, and the performance hit that comes along with that. [Victor] decided a solution to this problem would be to create a bit of circuitry that would be a sliding window to store address locations. Instead of storing the literal address for jumps in code, every branch in the code is stored as a location relative to whatever is in the program counter. The result is an easy way to JMP to code very far away in memory, with less of a performance hit. There’s an implementation for this sliding window token thing [Victor] whipped up for NXP’s ARM Cortex M3 microprocessor, and he’ll be working on an implementation of this concept in a new CPU over on his git. [Rodney Lederer] and his cat were bored after moving to a new city. He fixed that for both of them by taking on this project which turns a Wowwee robot into feline entertainment. It’s no secret that cats have a weakness for the little red dot produced by a laser pointer. [Rodney] put that trait to work by automating the movement of a red laser pointer. After mounting it on a servo motor he got down to work programming an Arduino to move it in a playful manner. But it wouldn’t have been much fun if the this was only capable of preprogrammed patterns, so he also included an IR proximity sensor to help give the thing interactivity. Add to that the treaded robot base and you’ve got mobile cat entertainment. The proof is in the video after the break… the cat is certainly having fun chasing the dot. [Rodney] plans to work a bit more on his code so that the motions of the laser dot include a lot of different patterns to keep things exciting.